The motorcycle ECU CDI unit is manufactured by Athena to OEM standards, the unit comes without a rev limiter meaning the engine can produce more torque. Athena is the brand you can trust with years of experience and a dedicated R&D team you can be sure that you are fitting an exceptional motorcycle part. In 1973 Athena was established in Italy and has become a major player in the aftermarket motorcycle parts industry. Athena's motorcycle division produce a myriad of electrical components, gaskets, seals, and pistons to cater for most motorbike brands. Athena has offices across the world and is trusted by motorcycle riders who are looking for quality parts for their bikes. The company have a strong standing amongst motocross riders and have been in partnership with top teams in the AMA Supercross Championship. 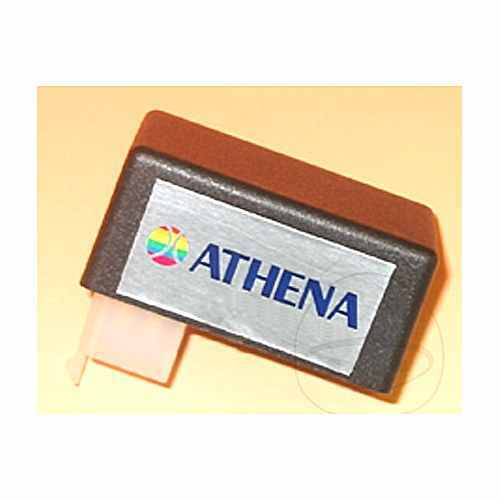 All Athena products are produced to OEM standards and have been stringently tested before they reach the consumer. Athena motorcycle parts also come with a 1-year manufactures warranty and are shipped from the UK.